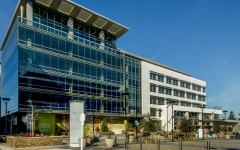 The Village at San Antonio Center is located in the northern end of Silicon Valley in Mountain View, California near major freeways and public transportation. 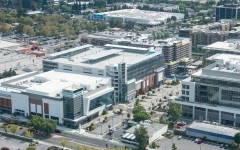 The Village is an urban mixed-use center that includes 225,000 SF of retail, 450,000 SF of office space, an upscale hotel, luxury cinema, and a contemporary 330-unit residential building. 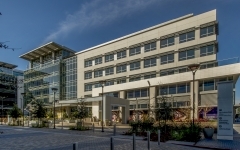 The Village includes two parking structures to serve visitors, residents and employees of the office buildings. Blocks 1 & 2 feature secured underground parking, providing 1,174 spaces on four subterranean levels. The office-building cores extend into the parking garage levels for easy access to ground-level commercial spaces and the offices above. Within the cores there are bicycle storage rooms for over 125 bikes, and showers and locker rooms for cyclists’ use. Additionally, there are 30 electric-vehicle parking stalls with capacity for expansion. Block 6 houses retail and eateries on the ground level, with a seven-screen cinema on the upper level. 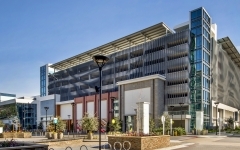 Block 5 consists of a 1,350-stall parking garage and 12,000 SF of retail space wrapping the perimeter of the structure. There is one level of subterranean parking dedicated to valet service for the adjacent hotel. The ground level and all elevated decks are reserved for retail and cinema parking. Patrons are guided to open parking stalls with a parking guidance system.